European R&D hub; electronic plants; counting atoms. A new European hub for semiconductor R&D is open for business. The hub is part of an EU-funded program called ASCENT or Access to European Nanoelectronics Network. The program is aimed to give researchers access to chip and related technologies within three European R&D organizations–CEA-Leti, Imec and the Tyndall National Institute. As reported, ASCENT was originally formed last summer by CEA-Leti, Imec and Tyndall. The €4.7 million project will share best practices, form a knowledge-innovation hub, and train new researchers. The program will enable researchers to gain access to 14nm (and beyond) CMOS device data and test chips. It will also help researchers to gain access to the characterization facilities at Tyndall, CEA-Leti and Imec. The hub is targeted to keep Europe at the cutting-edge of chip R&D. “We are confident that ASCENT will ensure that Europe remains at the forefront of global nanoelectronics development,” said Kieran Drain, chief executive of Tyndall National Institute, at the time when the project was announced. The hub is not only for European researchers, but also the R&D community outside of Europe. Over 70 researchers from 20 countries worldwide have already signed up through the ASCENT web site Access is fast and financial support is provided to users of the facilities. Linköping University (LiU), one of Sweden’s largest academic institutions, is developing electronic plants. Researchers have been able to implant polymers and chip structures inside living flowers, bushes and trees. The ultimate goal is to develop so-called power plants, which are plants embedded with sensors. With organic electronics integrated into plants, researchers could one day regulate the growth and other functions of plants. And in the distant future, they could also utilize energy from photosynthesis in a fuel cell. In a lab, LiU developed a new polymer, dubbed PEDOT-S. The water soluble polymer was absorbed into a rose. Then, the polymer transformed into a hydrogel. The hydrogel forms a thin film along the channel of a flower. Then, a conductive polymer was absorbed into the channel of the plant. An electrode was placed at each end of the plant. A gate was devised in the middle, thereby forming an analog transistor in the plant itself. 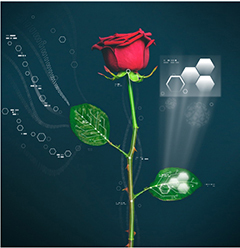 In another experiment, the polymer, along with nano-cellulose fibers, were absorbed into the foliage of the rose. The cellulose, in turn, forms a 3D-like structure with small cavities inside the rose leaf. The cavities are filled with the conductive polymer. Electrochemical cells are formed, creating pixels. “We can create electrochromatic plants in which the leaves change color – it’s cool, but maybe not so useful,” said Eliot Gomez, a researcher at LiU. Riken has developed a new way to count atoms. The new technique for counting atoms overcomes a fundamental limitation on resolution. And it does not disturb the atoms being measured. 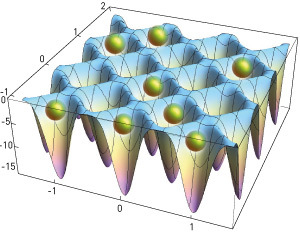 In the lab, researchers from Riken combined multiple laser beams, thereby creating a two-dimensional lattice of peaks and troughs. The pattern resembles an egg carton with individual sections. In the process, atoms are then cooled in the microkelvin regime. They, in turn, become trapped in the optical lattice or in the individual sections of the lattice. All told, researchers have found a non-destructive method for detecting atoms in an optical lattice with single-site resolution. “In all optical measurements, the wavelength of light imposes a fundamental limit on detection—two objects within a wavelength of each other cannot be resolved,” said Masahito Ueda, a researcher at Riken, on the organization’s Web site. “The physics behind this so-called diffraction limit is the fact that photons scattered from two point sources that lie within a wavelength tend to interfere, which smears out the peak positions of the image at the detector.